Betty Jean (Stewart) Barry was the fifth child born on August 22, 1925, to Joe and Clara Stewart on a farm just north of Magnolia, Iowa. At the age of 14, Betty met George Barry at the Logan 4th of July Celebration. They started dating soon after that, but they broke up when she got mad at him because he always blamed her when his car broke down. In her last year of high school, Betty took the teachers training and got certified to teach country school. She taught at various country schools, including Windy Ridge, just up the road from the farm she was raised. One evening her dad told her there was a “nice looking young man” at the door who wanted to see her. When she went to the door, she found George “in his Navy whites”, and she said her heart was his forever. They married on August 2, 1947. Since Betty was four months older than George, she wanted to get married before her August 22nd birthday so she would not be older than George on their marriage license. They were happily married for 53 years. George and Betty eventually moved just east of Pisgah (in the beautiful Loess Hills) where they farmed and lived for 47 years until George passed in 2000. They raised five chore boys and a jewel of a daughter. Although Betty was not much interested in the farm, she loved being a wife, mother, mother-in-law, grandmother and great grandmother. She was very faithful and active in her Catholic faith. She loved playing cards and she loved visiting with friends, relatives and even strangers. Talking to her kids and grandkids on the phone was always a highlight for Betty. Although she did not know much about cooking when she and George first got married, Betty became an excellent cook and was famous for her cinnamon rolls. Betty was always interested in numbers, like how many grandkids she had, how many birthday and Christmas cards she got and how long people were married. She also bragged that she was the oldest of any of her relatives in life, but she did not know why God kept her around for so long. 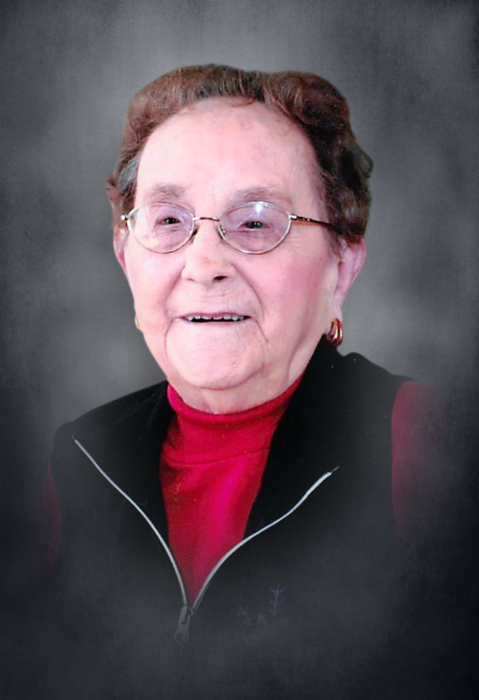 Betty died on January 29, 2019, at the Longview Home in Missouri Valley, Iowa attaining the age of 93 years, five months and seven days. Betty was preceded in death by her parents and her husband, George Barry; great granddaughter, Zoe Noell Duggan; her siblings, Marcella Stewart, Helena Reardon Oliver, Robert Stewart, Frances Geith and Shirley Kersten. She is survived by six children, Tim (Trudy) Barry of Waukee, Iowa, Todd (Connie) Barry of Sioux City, Iowa, Tom (Kay) Barry of Pisgah, Iowa, Julie (Robert) Blazek of Venice, Florida, Jeff (Donna) Barry of State Center, Iowa, and Joe (Chrissy) Barry of Coralville, Iowa; 18 grandchildren; 26+ great-grandchildren; two sisters-in-law, Shirley Knapp and Bobbi Forman; brother-in-law, John (Carol) Barry and many other relatives and friends. Now Betty will be in Heaven with God and back together with George. Memorials will be directed by the family or can be given to the charity of your choice.